P.J --I bet they had a ball making those, very colourful - just wait until they get a fish on them. Thy sure did have fun Pete (including me ) a couple off the boys had never made a Lure before, and thy were quit proud off them. Made me promis to hurry given them the clear cote, so thy cud show what thy made to their parrents. 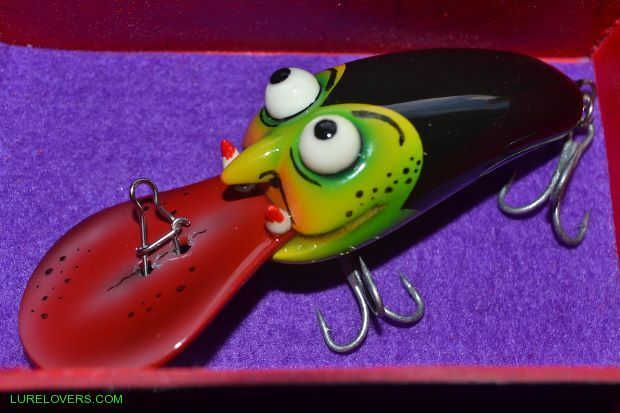 Thanks to a guy in the U.S I recently rediscovered these "swim Bait'' pictures, I made them about 10 years back. I thought I might post them here for safe keeping as I have lost the original pictures ----with all my computer crashes over the years I have lost heaps. These were all about 10Cm long, the green one was about 12Cm. Geezus! Very nice Do you need reminding of my address!!? Thanks Jas, lost most of them to snags years ago, the ''Brown Trout'' hooked a VERY nice Flathead @ Sussex Inlet , it came up out of deep water, grabbed the lure turned around and went to the bottom again,and was determined to stay there---------eventually snapped off, so now have none. Thanks Per, I DO appreciate any one who makes these as I know how much work goes into a "carved" one, these were all made with ''Celuka'' board (expanded PVC sheet). 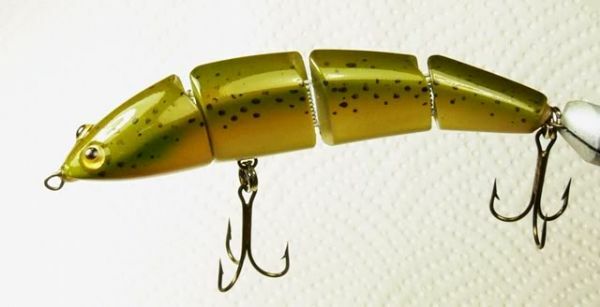 I think the hinge strength are the downfall of all Swim Baits. The hinges are something I developed ( 2008-10) to replace the old style ''eye hooks'' etc--They are stainless wire made into a "double helix'' which is like a hinge, but you don't need a çentre pin to hold it all together, although I did eventually add a centre pin as it is much more rigid and stronger ( I called them ''DNA hinges'' because of the double helix ). I also made a few of these pictured with "Velcro" backing tape hinges, these were indestructible . Mick, so much to do , so little time mate, these things consume hours per lure, but you are right Mick, bigger is certainly easier. P.S It's all coming back---Not sure BUT, I think Carl has one of those pictured . 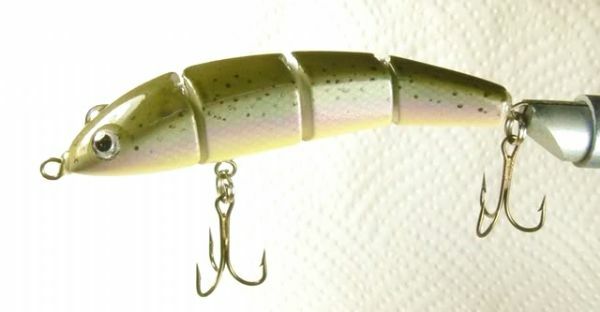 Pete, those swim baits look awesome. 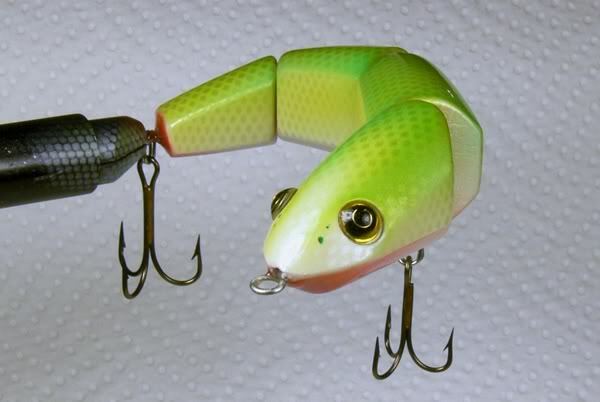 I would love one of these to add to my other Rayna lures. One day, if you ever get time mate. you need to make some more of these Pete!.its funny how Aussie makers have only started making these in the last few years yet you my old trendsetter friend were making these little beauties ten years ago! Chris as you know ole pete hes a freak...luv his stuff. I hope hes driving to expo?? Naaaaaaaaaaaaaaaaaaaaaa Jas /Chris, I was up there last week but had to come back, they have cut part of my ear off and have to be here for the unveiling of the new ear --- hope you guys are having fun, its pretty cool here today, 7C tomorrow .